So what are we looking at here, a still shot from the next Transformers movie? No, believe it or not, that is a human, one wrapped up in a wing-like contraption. This is a little pet project of the Special Parachute and Logistics Consortium called the Gryphon Next Generation Parachute System. The idea is instead of soldiers bail out of planes with parachute things on, they put something on that helps them take full advantage of the sky. In other words, it isn’t a parachute with a big silk canopy that is slowly falling to the earth like giant slow-moving target. 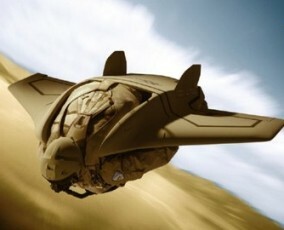 No, this Gryphon Next Generation Parachute System would allow a parachuting soldier to get far away (about 30 miles) and would be invisible to radar. Yes, I’m sure I’m not the only ones who are thinking this, but I would like to think that something like this would help jet-pack technology. Of course, they would need some sort of jet propulsion. Hopefully it would not end up like the first intercontinental Jetpack flight. Dang, what I wouldn’t give to try out something like that. Of course, this doesn’t look very safe. I suppose there will be a lot of soldiers who will need special training for these babies.